It has been close to two decades that I have been associated with the Bombay Natural History Society (BNHS) and during this time I learnt three words “B for BNHS”, “B for Biodiversity” and “B for Bugs”. My tenure as nature educator has been around and surrounded by these three words. As I evolved, adapted and discovered the nature educator in me, I designed programmes, projects and products around the beautiful word – biodiversity. But, before I write about my experience, let me first introduce you to BNHS’s Conservation Education Centre (CEC) – my workplace, and the greenest office in Mumbai. The BNHS Nature Reserve (BNR), a 33-acre forested land, sandwiched between Sanjay Gandhi National Park and Film City, was leased to BNHS in 1984. In 1993, BNHS conceptualized the Conservation Education Project, which helped establish India’s first Conservation Education Centre at BNR. The Center was thrown open to the public in 1997 and since then it has been operational in conducting conservation education programmes. The Centre offers a bouquet of programmes to bring you closer to nature. Being one of the first centres to promote conservation education in Mumbai, CEC rose to fame with its unique formula of ‘edutainment’. Currently, every year more than 20,000 visitors participate in different programmes of CEC. Although these courses are yet to be accredited, the certificates have been accepted by foreign universities as extra-credit or augmented credit courses. For professionals, these courses allow the opportunity for continued learning. These courses also serve as good professional development courses for teachers. In 2004, we announced the Breakfast with Butterflies programme, an idea picked up from the Bronx Zoo, New York. This is a fun-filled half-day event, which includes indoor and outdoor sessions such as butterfly watching, butterfly photography, baiting butterflies, gardening for butterflies, meet a butterfly expert and quizzes on butterflies. 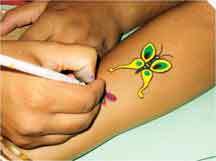 For children, butterfly craft, face-painting and a treasure hunt is arranged. This has been CEC’s most popular event. Its success led us to conduct several similar programmes, such as the Bash with Bugs, Toast to Trees, Lunch with Lilies, Fun with Fungi, Meal with Moths and Brunch with Birds. These events have helped in glamorizing the natural world. You too can design such events for your school or locality. First you will need to identify a suitable wilderness patch, where plenty of flowers grow or where many butterflies or birds visit. Then find a good local guide who can be your resource person or get hold of relevant BNHS publications and do your own initial study. BNHS’s Green Guide, which can be downloaded from http://www.bnhs.org/education-mainmenu/green-guide-for-teachers.html, provides many hands-on activities that you can incorporate in your events, so don’t forget to download it. Organize your special event and let us know. In 2008, we designed a series of training workshops – Green Lifestyles, Kitchen Garden and Fun with Fotography. These are intensive 2-3 day events, where the participants interact and work with field experts. These workshops provide hands-on experience to the participants and give in-depth knowledge about the topics. In the Green Lifestyles workshop, participants learn about recycling waste, rainwater harvesting, and energy and water conservation. In the Kitchen Gardening workshop, participants learn different techniques of Urban gardening. They set up plots for raising kitchen garden of herbs and vegetables. They also learn about plant care and making natural pesticide. The aim of the workshop is to get people to grow their own vegetables and to have pesticide-free food. The Fun with Fotography workshop provides participants with tips on photography. They are mentored by professional wildlife photographers, who review photos and provided participants with critical comments. The workshop is designed to cater to the digital boom in cameras and to use photography as tool for nature education. We also started a series of summer and winter nature camps for children of all age groups – Junior Nature Nuts, Junior Nature Champs, Jungli Natkhat, Child in the Wild, Jungle Camps, Eco-warriors Leadership Camp and so on. The focus of these camps is exploration in the wild, which helps in developing observational, leadership and analytical skills, and sensitivity towards nature. Many of the camp activities include field sessions, such as map-reading, GPS tracking, pond dipping (study of aquatic animals), quadrant studies, light trap (study of insects using a light and white screen), plant, bird, insect and herpetofauna walks. There are also making a bird nest, making a shelter in the wild, fire making, treasure hunt, and crisis management sessions. These camps help in grooming the overall personality of students. In 2011 we initiated our first citizen science project – Be a Scientist for a Day, where we wanted to bring students to work on wildlife research topics. As part of the project we conduct monthly surveys of BNR for plants, insects, birds and herpetofauna along with field experts. Participants can sign up for these surveys and learn methods of data collection and collation. We intend to collect such data till 2013 and then publish the findings. You too can get engaged with such citizen science projects by joining our ongoing online project on sparrows (visit www.citizensparrow.in). If you also want to highlight the plight of a vanishing species, it will be worthwhile to start a citizen science project and a good topic to begin with could be butterflies, as they are indicators of a good habitat. You can ask your students to record butterflies and if possible photograph them and post their findings on the Facebook/Yahoo Group sites on ButterflyIndia and get them identified. Similarly, you could also open a Facebook/Flickr group for your project and ask your students to post their butterfly pictures. In a year’s time you will be able to generate a lot of data, which could be analyzed and interpreted to arrive at species diversity, seasonality of species and species abundance. This data could be then correlated to the immediate habitat and positive/negative inferences could be drawn. You can also choose moths as your study topic and use Facebook/Yahoo groups on Indianmoths for assistance. For moth studies you need to set up a white bedsheet against a wall and hang a mercury lamp over it. The light will attract nocturnal insects which can be photographed and posted on the group for identification purposes. There are several online groups to help with the identification of flora and fauna. For instance, https://www.facebook.com/groups/DiversityIndia/. This portal is good to get instant access to experts from all over the country. CEC’s innovative initiatives need to be replicated in other parts of the country. As they say, small drops make an ocean; initiate small activities to begin a relationship with nature in your own localities and schools. Let us know if you need any assistance. You can visit www.bnhs.org to learn more about our activities. The author has been associated with BNHS for 20 years. Currently, she heads the Conservation Education Center of BNHS in Mumbai. She holds a Ph.D in entomology and her area of specialization is entomology. Being a scientist by passion and an educationist by profession she has infused research and education in a most innovative manner. She can be reached at vshubhalaxmi@gmail.com.